Hi! My friend Evelyn was in need of some doughnuts yesterday so I bought her some from Doughboy! They have some mighty tasty doughnuts. Yesterday was spent in Port Melbourne, drawing, chilling and having a good time together. You need to be able to do that with friends I think. Reconnect. 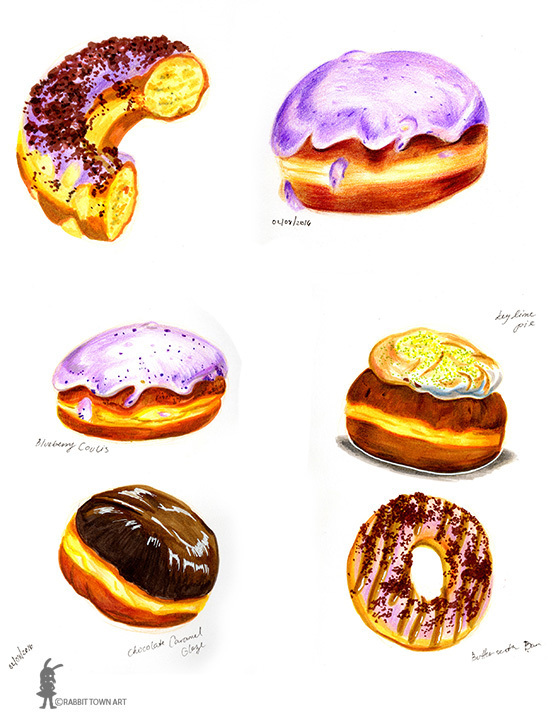 I am thinking of making a print of the doughnut drawings. I think I need to draw more. I like the 4 I did at the bottom and the half-eaten one. There's something almost vintage looking about this style. Today, I finished an animation job, some social media-in and did a little bit of work on my book job. Friday is going to be the day I concentrate on that gig, though. Tomorrow, i submit the animation gig. Hopefully it all goes smoothly!